Not too far from Milwaukee, there is a annual summer-time event called the Bristol Renaissance Faire. It’s a good time to be had by all. It’s been years since I have last went, but I recall it rather clearly. I remember the people dressed in costume, the shops, the activities, and their food. So my coworkers and I got to talking as the faire recently ended, and one coworker kept describing their mushrooms and how awesome they were. I was set out to make those, as I knew I would be putting them on pretty much anything, and that was the truth. 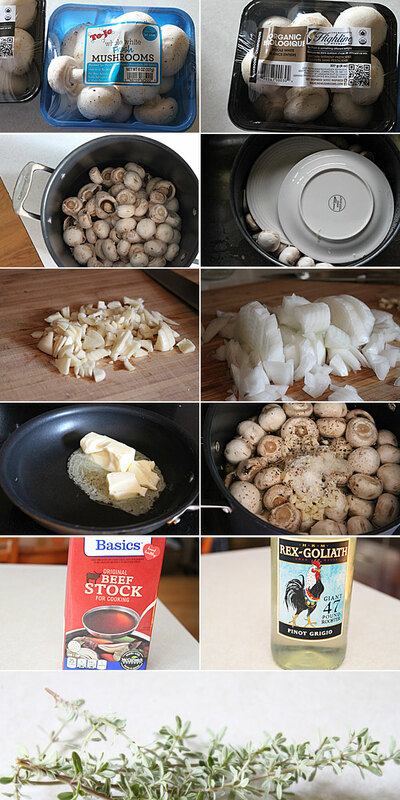 These mushrooms are perfect in texture, and have a great garlic and onion flavor. This is really super simple, and one that goes pretty much the majority of the day. Add the mushrooms to a large pot. Cover with water and the beef stock. Add a plate to the top, one that will fit, to make sure the mushrooms get a nice soaking until you are ready to add the remaining ingredients. Next, heat a large skillet on medium heat. Add the butter, and let it melt. Toss in the onions, garlic, and cracked black pepper. Give it a nice toss. Let this cook on medium heat, stirring along the way, just until the onions begin to soften, about 5-7 minutes. Remove the plate from the mushrooms, and add the onion mixture to the pot. Add in the salt, and white wine. Stir. Cover, and bring to a simmer, and cook for about 8 hours. Yes, 8 hours. About 6 hours in, remove the cover, bring the heat to medium, and add the sprigs of thyme. The broth will reduce a bit, and that’s what you want, but you will still have plenty of broth. It’s yummy. I could just eat that by itself. When you are ready to serve, ladle these in a bowl, or serve them as I did on top of mashed potatoes. Did I say that might be my favorite new combination? Mushrooms and mashed potatoes? These mushrooms are addicting. They are super tender and just have an awesome taste. I mean you can’t go wrong with garlic, onion, butter, and wine. It makes quiet a bit, so reduce how many ounces of mushrooms you want to make. When I was cooking these, I thought that you could probably get away with these by making them in a slow cooker. I hope you enjoy! Perfect cool, wet weekend in the Chicago burbs to try this. Looks excellent!! Thanks for sharing. 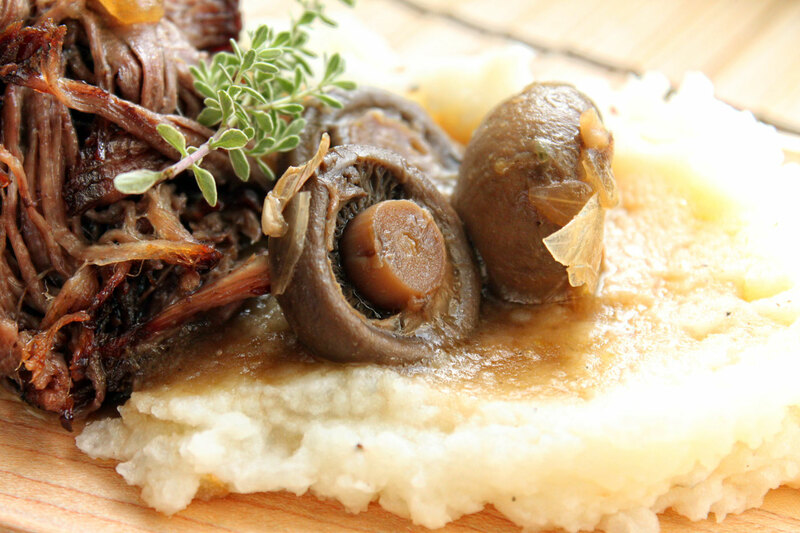 I’ve made similar mushroom recipe in the crock pot and it did work wonderfully! I served as a side dish on thanksgiving. Leftovers were awesome on top of spaghetti sauce and baked potatoes, too! Awesome, and good to know. I’m thinking about making these for the holiday season as well as they feed a lot and are perfect. Thank you so much for sharing this. I go to this faire every year and I’ve been trying to find a recipe for something similar to those exact mushrooms for AGES. I will have to try this soon!